Hello There! Volunteers are at the foundation of what we do and deliver. 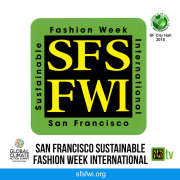 We would like to invite you to be part of the this year's SFSFWI program. We are looking to organize our events and what information we bring to our audiences. In September 2018, we had our fabulous Green Glam SF at City Hall. In addition, our event was part of the Global Climate Action Summit as an affiliate event and partner for climate change solutions. San Francisco Sustainable Fashion Week International, SFSFWI.org brings environmental preservation and the health of future generations at the core of our mission. We are filming the events to educate a larger group of people through television and digital media. Social Media Kings and Queens! If you have lots of people following you and you love to be in touch with those who love your postings, we need your support and talent! We are looking for those with experience in sales to support these efforts. This is a commission paid position. If you are new in the work force, we provide you with experience to add onto your resume. We offer to you guidance and support in finding what you are seeking for. Each Volunteer must arrange an initial call with Sandra. Text her with your name and the message: I need a call with you. 415.517.0818 Thank you!